Thanksgiving is filled with opulence: the food – both quantity and quality, the family, the leftovers, the flavors, the fun… the wine. But the Thanksgiving holiday can be a challenge when it comes to wine selections and what to pour for guests. With so many side dishes, mixes of flavors, and lots of savory and sweet combinations, purchasing wine for the Thanksgiving meal can be difficult for the host. Unless you are planning a course-by-course wine dinner, finding one or two wines that all of your guests will love can be a daunting challenge. Rule number one when picking out wines for any event: buy what you or your guests enjoy. Regardless of what you may read, there are no hard rules for what to drink with the Thanksgiving meal. Wine and food pairing suggestions are filled with holes, and ultimately, it is most important that you and your guests enjoy what you’re drinking. After all, it is a holiday meant to be enjoyed! A simply bright sparkling wine with fresh and peach skin flavors. Refreshing and fruity. If you’re tasked with bringing wine for Thanksgiving, or you just want to be a great Thanksgiving guest, here are a few of my go-to wine suggestions. Every time you are in a difficult food-and-wine-pairing situation, sparkling wine can become your best friend. The Thanksgiving meal is no exception to this rule. Imagine a house full of guests, waiting to get their hands on a nice glass of wine. Who doesn’t like being greeted with a glass of bubbly? It’s the perfect wine to accompany all of the preparation. Bonus: there are a lot of good sparkling wines out there that will not break the bank. 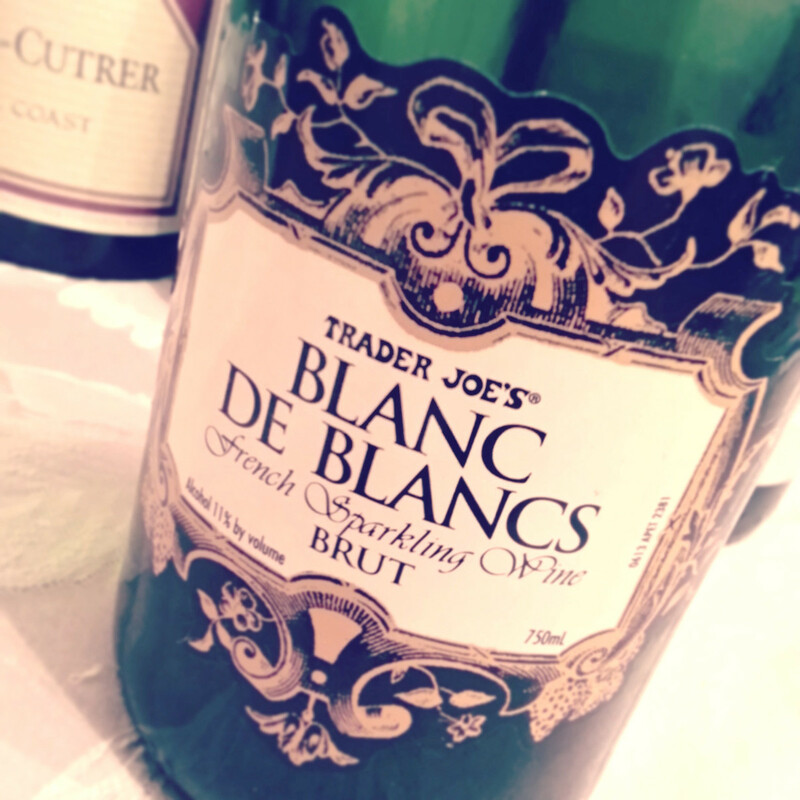 A classic sparkling wine with lemon zest and baked biscuit flavors. I miss the days when purchasing wine from Trader Joe’s was a possibility for me. 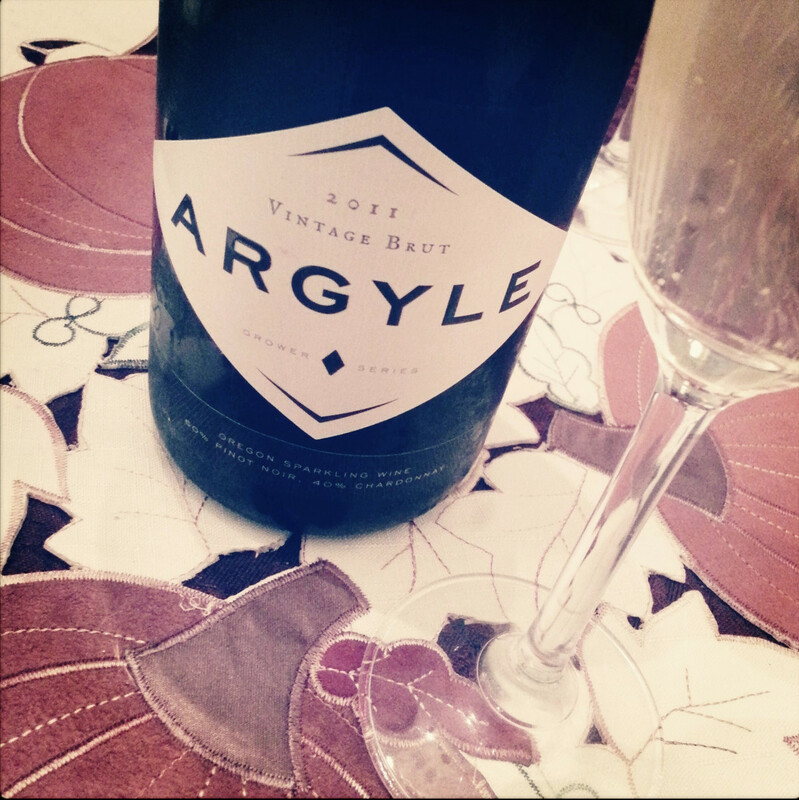 If you are looking for a budget friendly option, don’t be afraid to siphon through their sparkling wine options. Prosecco, from Italy, offers a fruitier sparkling wine style that is preferred by most consumers. It’s dry (Brut) and lacks any biscuit-like flavors associated with high end Champagne. For those that prefer sweet wine, I suggest picking up an Asti from Italy. The Muscat (Moscato) grape is the variety in this wine and is also produced in a sparkling style. 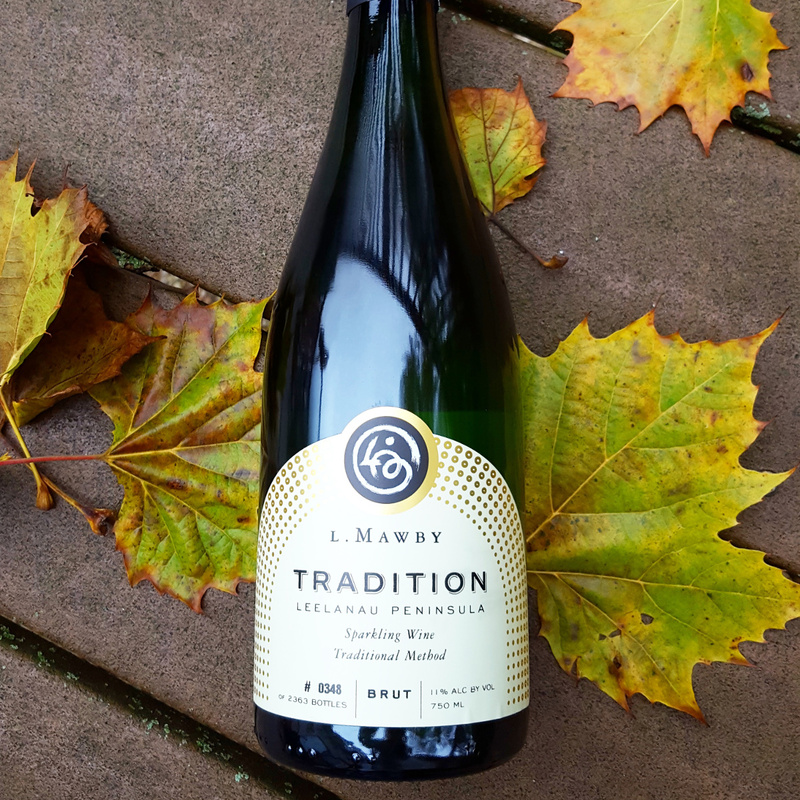 A high-end refreshingly floral and fruity sparkling wine. York, Pennsylvania, Texas, and Virginia. If you need a “local” suggestion, ask me on Facebook or check out some of my past wines on Instagram. For something a bit higher end, and a bit more obscure, I’ve been digging Argyle’s sparkling wines from Oregon this year. Most of these will range in the $30 – $80 price point, but they’d make a lovely complement to the Thanksgiving meal. The Riesling wine variety is quite versatile during the Thanksgiving meal. The best part is, if you are purchasing a few bottles, you have the opportunity to purchase both dry and sweet Rieslings, which will accommodate all of your guests’ sweetness preferences. Many New World Rieslings list how sweet the wine is on the back label. While pronunciation of these words can be intimidating, they simply describe the sugar concentration and maturity of the Riesling grapes when picked at harvest. Kabinett is the “least ripe,” while Trockenbeerenauslese is the “most ripe” or containing the most sugar at harvest. There’s a small trick to understanding German Rieslings. First, only Kabinett, Spätlese, and Auslese styles can be made dry (i.e., no residual sugar). If those three classifications are dry, the word “trocken” will typically appear on the front label. Usually, at dryness, a Kabinett Riesling will be about 12% alcohol. This will also be the lightest [bodied] Riesling amongst the group of three. Take care to make sure you aren’t confusing “Auslese trocken” (dry, Auslese maturity level) with “Trockenbeerenauslese” (sweet). If you see “halbtrocken” following one of the three terms, Kabinett, Spätlese, and Auslese, it means the wine is off-dry, or has a little bit of sweetness. If you do not see either of these two terms (trocken, halbtrocken) on the label within those three classifications (Kabinett, Spätlese, and Auslese), it is assumed the Riesling wine is fairly sweet. Both Berenauslese and Trockenbeerenauslese are always sweet, but also delicious and bursting with flavor. Aromatic white wine lovers will truly enjoy these wines. If Riesling is not your thing, there are a number of other aromatic white wines that may be fun to consume on Thanksgiving Day: Moscato, Albariño, Viognier, and Vidal Blanc (dry or sweet) are great wine grape varieties to choose from. 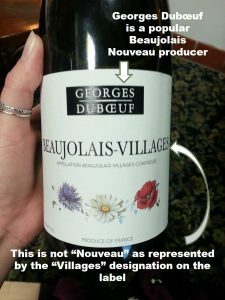 Beaujolais Nouveau is not often recommended by wine enthusiasts, but this is an easy selection that comes out right before Thanksgiving (released the 3rd Thursday of November in the U.S.) that consumers tend to enjoy. Beaujolais Nouveau is made in the French region, Beaujolais, using a special processing technique called “carbonic maceration.” This technique dictates the wine style, providing a candied, fruity, sometimes banana-nuanced, light-bodied red wine marketed and labeled as Beaujolais Nouveau. It is the type of wine that is purchased in November and should be consumed before the New Year rolls around. This is not the type of red wine that will benefit from any long-term aging. Beaujolais or Beaujolais-Villages (refer to the picture) is another purchasing option, typically made with the red grape variety, Gamay. Gamay is lovely as it is less tannic and astringent than wines made with more familiar varieties like Cabernet Sauvignon. That softness associated with Gamay wines may be the perfect combination with the turkey and Thanksgiving trimmings for those that enjoy a red wine during the main feast. If you live in a region that is flush with hybrid wine grape varieties, now would be the time to put them on the dinner table. Usually high in acidity and relatively neutral in aromatics, these wines can pair with many foods. Look for Marquette, Chambourcin, De Chaunac, and Chancellor wine grape varieties.